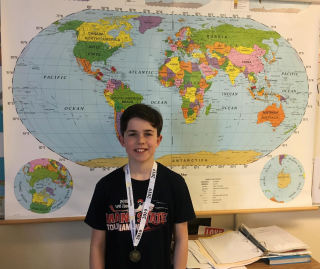 On Friday, March 29 Windham Middle School seventh grader, Caden Violette, will be heading to the state finals for the 2019 National Geographic GeoBee. For the 31st year, the National Geographic Society is holding the GeoBee for students in the fourth through eighth grades. Thousands of schools are competing in this year’s contest from across the United States and the five U.S. territories. The National Geographic Society developed the GeoBee in 1989 in response to concern about the lack of geographic knowledge among young people in the U.S. Over more than three decades, 120 million students have participated in the GeoBee. The qualification process began with all students participating in a written test. The students who qualified then participated in the school finals, similar to a classic spelling bee. There were a few rounds for which each student was asked a question. Then, the top two moved on to the school championship round where each finalist was provided a written question, they both had to answer. The final question was: There is a skiing competition that takes place in the Scandinavian country with the highest population. What country is that? The answer: Sweden. Violette, the Windham Middle School champion, after answering the above question correctly, will now move on to the state level contest taking place at the University of Maine, in Farmington, on March 29. This event includes the top 100 qualifiers for the state.